Settlement bi anatomically modren humans o whit wis tae acome the Unitit Kinrick occurred in waves beginnin bi aboot 30,000 years agae. Bi the end o the region's prehistoric period, the population is thocht tae hae belanged, in the main, tae a cultur termed Insular Celtic, comprisin Brythonic Breetain an Gaelic Ireland. The Roman conquest, beginnin in 43 AD, an the 400-year rule o soothren Breetain, wis follaed bi an invasion bi Germanic Anglo-Saxon settlers, reducin the Brythonic area mainly tae whit wis tae acome Wales, Cornwall an the historic Kinrick o Strathclyde. Maist o the region settled bi the Anglo-Saxons becam unifee'd as the Kinrick o Ingland in the 10t century. Meanwhile, Gaelic-speakers in north-wast Britain (wi connections tae the north-east o Ireland an tradeetionally supposed tae hae migratit frae thare in the 5t century) unitit wi the Picts tae creaut the Kinrick o Scotland in the 9t century. The early modren period saw releegious conflict resultin frae the Reformation an the introduction o Protestant state kirks in ilk kintra. Wales wis fully incorporatit intae the Kinrick o Ingland, an Ireland wis constitutit as a kinrick in personal union wi the Inglis croun. In 1603, Elizabeth I o Ingland deed an Jamie the Saxt o Scotland becam James the First o Ingland an aa. Tha Acts o Union 1707 makkit tha Kinrick o Great Breetain an tha Scots Pairlament wis unitit wi tha Inglis pairlament in Lunnon. In the mid-17t century, aw three kinricks war involved in a series o connectit wars (includin the Inglis Ceevil War) that led tae the temporar owerthraw o the monarchy an the establishment o the short-leeved unitar republic o the Commonweel o Ingland, Scotland an Ireland. Awtho the monarchy wis restored, the Interregnum ensured (alang wi the Glorious Revolution o 1688 an the subsequent Bill of Rights 1689, an the Claim of Right Act 1689) that, unlik muckle o the rest o Europe, ryal absolutism wad nae prevail, an a professed Catholic coud niver accede tae the thrane. The Breetish constitution wad develop on the basis o constitutional monarchy an the pairlamentar seestem. Tho previous attempts at unitin the twa kinricks within Great Breetain in 1606, 1667, an 1689 haed pruived unsuccessfu, the attempt initiatit in 1705 led tae the Treaty o Union o 1706 bein agreed an ratified bi baith pairlaments. On 1 Mey 1707, the unitit Kinrick o Great Breetain came intae bein, the result o Acts o Union bein passed bi the pairlaments o Ingland an Scotland tae ratify the 1706 Treaty o Union an sae unite the twa kinricks. In the 18t century, cabinet govrenment developed unner Robert Walpole, in practice the first prime meenister (1721–1742). A series o Jacobite Uprisins socht tae remuive the Protestant Hoose o Hanover frae the Breetish thrane an restore the Catholic Hoose o Stuart. The Jacobites war feenally defeatit at the Battle o Culloden in 1746, efter that the Scots Hielanders war brutally suppressed. The Breetish colonies in North Americae that brak awey frae Britain in the American War o Unthirldom becam the Unitit States o Americae, recognised bi Britain in 1783. Breetish imperial ambition turned taewart Asie, pairteecularly tae Indie. Efter the defeat o Fraunce at the end o the Revolutionary an Napoleonic Wars (1792–1815), Great Breetain emerged as the principal naval an imperial pouer o the 19t century (wi Lunnon the lairgest ceety in the warld frae aboot 1830). Unchallenged at sea, Breetish dominance wis later descrived as Pax Britannica ("Breetish Peace"), a period o relative peace amang the Great Pouers (1815–1914) in that the Breetish Empire becam the global hegemon an adoptit the role o global polisman. Breetain focht alangside Fraunce, Roushie an (efter 1917) the Unitit States, against Germany an its allies in the First Warld War (1914–1918). Breetish airmed forces war engaged athort muckle o the Breetish Empire an in several regions o Europe, pairteecularly on the Wastren front. The heich fatalities o trench warfare caused the loss o muckle o a generation o men, wi lastin social effects in the naition an a great disruption in the social order. The rise o Erse naitionalism, an disputes within Ireland ower the terms o Erse Hame Rule, led eventually tae the pairteetion o the island in 1921. The Erse Free State becam independent wi Dominion status in 1922. Northren Ireland remeened pairt o the Unitit Kinrick. A wave o strikes in the mid-1920s culminatit in the General Strike o 1926. Britain haed still nae recuivered frae the effects o the war whan the Great Depression (1929–1932) occurred. This led tae conseederable unemployment an haurdship in the auld industrial auries, as weel as poleetical an social unrest in the 1930s, wi risin membership in communist an socialist pairties. A coaleetion govrenment wis formed in 1931. Breetain entered the Seicont Warld War bi declarin war on Nazi Germany in 1939, efter Germany haed invadit Poland. Winston Churchill becam prime meenister an heid o a coaleetion govrenment in 1940. Despite the defeat o its European allies in the first year o the war, Breetain an its Empire conteena'd the ficht alane against Germany. In 1940, the Ryal Air Force defeatit the German Luftwaffe in a struggle for control o the skies in the Battle o Breetain. Urban auries suffered hivy bombin in the Blitz. Thare war an aa eventual haurd-focht veectories in the Battle o the Atlantic, the North Africae campaign an the Burma campaign. Breetish forces played an important role in the Normandy laundins o 1944, achieved wi its Unitit States ally. Efter the end o the Seicont Warld War in 1945, the UK wis ane o the Big Fower pouers (alang wi the U.S., the Soviet Union, an Cheenae) that met tae plan the post-war warld; it wis an oreeginal seegnatory tae the Declaration o the Unitit Naitions. The UK wis the third kintrea tae develop a nuclear wappens airsenal (wi its first atomic bomb test in 1952), but the new post-war leemits o Breetain's internaitional role war illustratit bi the Suez Creesis o 1956. In the decade-lang process o European integration, the UK wis a foondin member o the alliance cried the Wastren European Union, established wi the Lunnon an Paris Conferences in 1954. In 1960 the UK wis ane o the seiven foondin members o the European Free Tred Association (EFTA), but in 1973 it left tae jyne the European Commonties (EC). Whan the EC becam the European Union (EU) in 1992, the UK wis ane o the 12 foondin members. Frae the late 1960s, Northren Ireland suffered communal an paramilitar veeolence (whiles affectin ither pairts o the UK) conventionally kent as the Tribbles. It is uisually conseedert tae hae endit wi the Belfast "Guid Fryday" Agreement o 1998. Aroond the end o the 20t century thare war major cheenges tae the govrenance o the UK wi the establishment o devolved admeenistrations for Scotland, Wales an Northren Ireland. In 2016, the Unitit Kinrick votit tae leave the European Union. The legal process o leavin the EU begoud on 29 Mairch 2017, wi the UK's invocation o Airticle 50 o the Treaty o Lisbon, formally notifyin the EU o the UK's intention tae leave. The airticle stipulates that the negotiations tae leave will last at least twa years. The UK remeens a full member o the EU in this time. The tot aurie o the Unitit Kinrick is approximately 243,610 square kilometres (94,060 sq mi). The kintra occupies the major pairt o the Breetish Isles airchipelago an includes the island o Great Breetain, the north-eastren ane-saxt o the island o Ireland an some smawer surroondin islands. It lies atween the North Atlantic Ocean an the North Sea wi the sooth-east coast comin within 22 miles (35 km) o the coast o northren Fraunce, frae that it is separatit bi the Inglis Channel. In 1993 10% o the UK wis forestit, 46% uised for pastures an 25% cultivatit for agricultur. The Ryal Greenwich Observatory in Lunnon is the definin pynt o the Prime Meridian. The Unitit Kinrick lies atween latitudes 49° tae 61° N, an longitudes 9° W tae 2° E. Northren Ireland shares a 224-mile (360 km) laund boondary wi the Republic o Ireland. The coastline o Great Breetain is 11,073 miles (17,820 km) lang. It is connectit tae continental Europe bi the Channel Tunnel, that at 31 miles (50 km) (24 miles (38 km) unnerwatter) is the langest unnerwatter tunnel in the warld. Ingland accoonts for juist ower hauf o the tot aurie o the UK, cuiverin 130,395 square kilometres (50,350 sq mi). Maist o the kintra consists o lawland terrain, wi moontainous terrain north-wast o the Tees-Exe line; includin the Cumbrian Moontains o the Loch Destrict, the Pennines, Exmoor an Dartmoor. The main rivers an estuaries are the Thames, Severn an the Humber. Ingland's heichest moontain is Scafell Pike (978 metres (3,209 ft)) in the Loch Destrict. Its principal rivers are the Severn, Thames, Humber, Tees, Tyne, Tweed, Avon, Exe an Mersey. Scotland accoonts for juist unner a third o the tot aurie o the UK, cuiverin 78,772 square kilometres (30,410 sq mi) an includin nearly aicht hunder islands, predominantly wast an north o the mainland; notably the Hebrides, Orkney Islands an Shetland Islands. Scotland is the maist moontainous kintra in the UK an its topografie is distinguished bi the Hieland Boondary Faut—a geological rock fractur—that traverses Scotland frae Arran in the wast tae Stanehyve in the east. The faut separates twa distinctively different regions; namely the Hielands tae the north an wast an the lawlands tae the sooth an east. The mair rugged Hieland region conteens the majority o Scotland's moontainous laund, includin Ben Nevis that at 1,343 metres (4,406 ft) is the heichest pynt in the Breetish Isles. Lawland auries—especially the narrae waist o laund atween the Firth o Clyde an the Firth o Forth kent as the Central Belt—are flatter an hame tae maist o the population includin Glesga, Scotland's lairgest ceety, an Edinburgh, its caipital an poleetical centre, awtho upland an moontainous terrain lies within the Soothren Uplands. Wales accoonts for less nor a tent o the tot aurie o the UK, cuiverin 20,779 square kilometres (8,020 sq mi). Wales is maistly moontainous, tho Sooth Wales is less moontainous nor North an mid Wales. The main population an industrial auries are in Sooth Wales, consistin o the coastal ceeties o Cairdiff, Swansea an Newport, an the Sooth Wales Valleys tae their north. The heichest moontains in Wales are in Snowdonie an include Snowdon (Welsh: Yr Wyddfa) that, at 1,085 metres (3,560 ft), is the heichest peak in Wales. The 14, or possibly 15, Welsh moontains ower 3,000 feet (910 metres) heich are kent collectively as the Welsh 3000s. Wales haes ower 2,704 kilometres (1,680 miles) o coastline. Several islands lie aff the Welsh mainland, the lairgest o that is Anglesey (Ynys Môn) in the north-wast. Northren Ireland, separatit frae Great Breetain bi the Erse Sea an North Channel, haes an aurie o 14,160 square kilometres (5,470 sq mi) an is maistly hilly. It includes Lough Neagh that, at 388 square kilometres (150 sq mi), is the lairgest loch in the Breetish Isles bi aurie. The heichest peak in Northren Ireland is Slieve Donard in the Mourne Moontains at 852 metres (2,795 ft). The Unitit Kinrick haes a temperate climate, wi plentifu rainfaw aw year roond. The temperatur varies wi the saisons seendle drappin ablo −11 °C (12 °F) or risin abuin 35 °C (95 °F). The prevailin wind is frae the sooth-wast an beirs frequent spells o mild an wet wather frae the Atlantic Ocean, awtho the eastren pairts are maistly sheltered frae this wind syne the majority o the rain faws ower the wastren regions the eastren pairts are tharefore the driest. Atlantic currents, wairmed bi the Gulf Stream, bring mild winters; especially in the wast whaur winters are wet an iven mair sae ower heich grund. Simmers are wairmest in the sooth-east o Ingland, bein closest tae the European mainland, an cuilest in the north. Hivy snawfaw can occur in winter an early ware on heich grund, an occasionally settles tae great deepth awey frae the hills. The UK haes a pairtially regulatit mercat economy. Based on mercat exchynge rates, the UK is theday the fift-lairgest economy in the warld an the seicont-lairgest in Europe efter Germany. HM Thesaury, led bi the Chancellor o the Exchequer, is responsible for developin an executin the govrenment's public finance policy an economic policy. The Bank o Ingland is the UK's central bank an is responsible for issuin notes an cunyies in the naition's siller, the poond sterling. Banks in Scotland an Northren Ireland reteen the richt tae issue thair awn notes, subject tae reteenin eneuch Bank o Ingland notes in reserve tae cuiver their issue. The poond sterling is the warld's third-lairgest reserve siller (efter the US dollar an the euro). Syne 1997 the Bank o Ingland's Monetary Policy Committee, heidit bi the Govrenor o the Bank o Ingland, haes been responsible for settin interest rates at the level necessar tae achieve the oweraw inflation target for the economy that is set bi the Chancellor ilk year. The UK service sector maks up aroond 79% o GDP. In the 2011 census the tot population o the Unitit Kinrick wis 63,181,775. It is the third-lairgest in the European Union, the fift-lairgest in the Commonweel an the 22nt-lairgest in the warld. The UK's de facto offeecial leid is Inglis. Houiver, thar is monie leids spak in the Unitit Kinrick bi baith native an immigrant. In the 2001 census 71.6% o aw respondents indicatit that thay war Christians, wi the next lairgest faiths bein Islam (2.8%), Hinduism (1.0%), Sikhism (0.6%), Judaism (0.5%), Buddhism (0.3%) an aw ither releegions (0.3%). 15% o respondents statit that thay haed na releegion, wi a forder 7% nae statin a releegious preference. The Unitit Kinrick is a unitar state unner a constitutional monarchy. 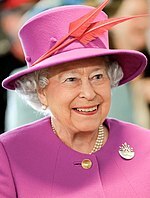 Queen Elizabeth II haes been the monarch an heid o state o the UK, as weel as Queen o fifteen ither independent Commonweel kintras. The monarch haes "the richt tae be consultit, the richt tae encourage, an the richt tae wairn". The Constitution o the Unitit Kinrick is uncodified an consists maistly o a collection o disparate written soorces, includin statutes, juidge-made case law an internaitional treaties, thegither wi constitutional conventions. As thare is na technical difference atween ordinar statutes an "constitutional law", the UK Pairlament can perform "constitutional reform" semply bi passin Acts o Pairlament, an sicweys haes the poleetical pouer tae cheenge or abolish awmaist ony written or unwritten element o the constitution. Houiver, na Pairlament can pass laws that futur Pairlaments canna cheenge. The UK haes a pairlamentar govrenment based on the Wastmeenster seestem that haes been emulatit aroond the warld: a legacy o the Breetish Empire. The pairlament o the Unitit Kinrick meets in the Palace o Wastmeenster an haes twa houses: an electit Hoose o Commons an appointit Hoose o Lairds. Aw bills passed are gien Ryal Assent afore acomin law. The poseetion o prime meenister,[note 8] the UK's heid o govrenment, belangs tae the person maist likely tae command the confidence o the Hoose o Commons. The Inglis playwright an poet William Shakespeare is widely regairdit as the greatest dramatist o aw time, Robert Burns is a weel kent an praised poet. The Beatles hae internaitional sales o ower ane billion units an are the biggest-sellin an maist influential baund in the history o popular muisic. Ither prominent Breetish contreibutors tae hae influenced popular muisic ower the last 50 years include The Rolling Stones, Pink Floyd, Queen, Led Zeppelin, the Bee Gees, an Elton John, aw o that hae warldwide record sales o 200 million or mair. The Unitit Kinrick haes haed a conseederable influence on the history o the cinema. The Breetish directors Alfred Hitchcock, that's film Vertigo is conseedert bi some creetics as the best film o aw time, an David Lean are amang the maist critically acclaimed o aw-time. ither important directors includin Charlie Chaplin, Michael Powell, Carol Reed, Edgar Wright, Christopher Nolan, an Ridley Scott. Mony Breetish actors hae achieved internaitional fame an creetical success, includin: Julie Andrews, Richard Burton, Michael Caine, Colin Firth, Gary Oldman, Ben Kingsley, Ian McKellen, Liam Neeson, Charlie Chaplin, Sean Connery, Vivien Leigh, David Niven, Laurence Olivier, Peter Sellers, Kate Winslet, Anthony Hopkins, an Daniel Day-Lewis. Major sports, includin association fitbaa, tennis, rugby union, rugby league, gowf, boxin, netbaw, rowin an cricket, oreeginatoy or war substantially developed in the UK an the states that precedit it. Wi the rules an codes o mony modren sports inventit an codifee'd in late 19t century Victorian Breetain, in 2012, the Preses o the IOC, Jacques Rogge, statit; "This great, sports-loving country is widely recognised as the birthplace of modern sport. It was here that the concepts of sportsmanship and fair play were first codified into clear rules and regulations. It was here that sport was included as an educational tool in the school curriculum". ↑ Thare is no authorised version o the naitional anthem as the wirds are a matter o tradeetion; anly the first verse is uisually sung. No law wis passed makin "God Save the Queen" the offeecial anthem. In the Inglis tradeetion, such laws are nae necessary; proclamation an uisage are sufficient tae mak it the naitional anthem. "God Save the Queen" an aa serves as the Ryal anthem for certain Commonweel realms. ↑ Unner the Cooncil o Europe's European Charter for Regional or Minority Leids, Scots, Ulster-Scots, Welsh, Cornish, Erse an Scots Gaelic, are offeecially recognised as regional or minority leids bi the Breetish govrenment for the purposes o the Charter. See an aa Leids o the Unitit Kinrick. ↑ Awtho Northren Ireland is the anly pairt o the UK that shares a laund mairch wi anither sovereign state, twa o its Owerseas Territories an aa share laund mairches wi ither sovereign kintras. Gibraltar shares a mairch wi Spain, while the Sovereign Base Auries o Akrotiri an Dhekelia share borders wit the Republic o Cyprus, the Turkis Republic o Northren Cyprus an the UN buffer zone separatin the twa Cypriot polities. ↑ In the referendum o 23 Juin 2016, a majority votit for the Unitit Kinrick tae widraw frae the European Union, but the process an date for Brexit hae yet tae be determined. ↑ The Anglo-Erse Treaty wis signed on 6 December 1921 tae resolve the Erse War o Unthirldom. Whan it teuk effect ane year later, it established the Erse Free State as a separate dominion within the Commonweel. The UK's current name wis adoptit tae reflect the cheenge. ↑ Syne the early twentiet century the prime meenister haes held the office o First Laird o the Thesaury, an in recent decades haes an aa held the office o Meenister for the Ceevil Service. ↑ "List of declarations made with respect to treaty No. 148". Council of Europe. Retrieved 12 December 2013. ↑ 3.0 3.1 3.2 "United Kingdom". International Monetary Fund. Retrieved 15 April 2015. ↑ "2014 Human Development Report" (PDF). 14 March 2013. pp. 22–25. Retrieved 27 July 2014. ↑ The 30 Largest Urban Agglomerations Ranked by Population Size at Each Point in Time, 1950-2030, World Urbanization Prospects, the 2014 revision, Population Diveesion o the Unitit Naitions Depairtment o Economic an Social Affairs. Retrieved 22 February 2015. ↑ "Countries within a country". Prime Minister's Office. 10 January 2003. Archived frae the oreeginal on 9 September 2008. Retrieved 8 March 2015. ↑ "Country Overviews: United Kingdom". Transport Research Knowledge Centre. Archived frae the oreeginal on 4 April 2010. Retrieved 28 March 2010. ↑ "Key facts about the United Kingdom". Directgov. Archived frae the oreeginal on 15 October 2012. Retrieved 6 March 2015. ↑ Davies, John; Jenkins, Nigel; Baines, Menna; Lynch, Peredur I., eds. (2008). The Welsh Academy Encyclopaedia of Wales. Cardiff: University of Wales Press. p. 915. ISBN 978-0-7083-1953-6. ↑ Westwell, I.; Cove, D. (eds) (2002). History of World War I, Volume 3. Lunnon: Marshall Cavendish. pp. 698 an 705. ISBN 0-7614-7231-2. ↑ 62.0 62.1 62.2 62.3 "United Kingdom". The World Factbook. Central Intelligence Agency. Retrieved 23 September 2008. ↑ 63.0 63.1 63.2 63.3 63.4 Latimer Clarke Corporation Pty Ltd. "United Kingdom – Atlapedia Online". Atlapedia.com. Retrieved 26 October 2010. ↑ 65.0 65.1 Darkes, Giles (January 2008). "How long is the UK coastline?". The British Cartographic Society. Retrieved 24 January 2015. ↑ "The Channel Tunnel". Eurotunnel. Archived frae the oreeginal on 18 December 2010. Retrieved 8 March 2015. ↑ "Scotland Facts". Scotland Online Gateway. Archived frae the oreeginal on 21 June 2008. Retrieved 16 July 2008. ↑ "UK climate summaries". Met Office. Archived frae the oreeginal on 27 May 2012. Retrieved 1 May 2011. ↑ "More About the Bank". Bank of England. n.d. Archived frae the oreeginal on 12 March 2008. ↑ "English language – Government, citizens and rights". Directgov. Archived frae the oreeginal on 15 October 2012. Retrieved 23 August 2011. ↑ "UK Census 2001". National Office for Statistics. Archived frae the oreeginal on 12 March 2007. Retrieved 22 April 2007. ↑ "Religious Populations". Office for National Statistics. 11 October 2004. Archived frae the oreeginal on 6 June 2011. ↑ Carter, Sarah. "A Guide To the UK Legal System". University of Kent at Canterbury. Archived frae the oreeginal on 27 May 2012. Retrieved 16 May 2006. ↑ "Parliamentary sovereignty". UK Parliament. n.d. Archived frae the oreeginal on 27 May 2012. ↑ "The Government, Prime Minister and Cabinet". Public services all in one place. Directgov. Archived frae the oreeginal on 21 September 2012. Retrieved 9 March 2015. ↑ MSN Encarta Encyclopedia article on Shakespeare. Archived frae the oreeginal on 9 February 2006. Retrieved 26 February 2006. ↑ "1960–1969". EMI Group. Archived frae the oreeginal on 25 April 2014. Retrieved 9 March 2015. ↑ "Paul At Fifty". Time. New York. 8 June 1992. ↑ Most Successful Group The Guinness Book of Records 1999, p. 230. Retrieved 19 March 2011. ↑ "British rock legends get their own music title for PlayStation3 and PlayStation2" (Press release). EMI. 2 February 2009. Archived frae the oreeginal on 23 April 2014. Retrieved 9 March 2015. ↑ "The Directors' Top Ten Directors". British Film Institute. Archived frae the oreeginal on 27 May 2012. Wikimedia Commons haes media relatit tae United Kingdom. This page wis last eeditit on 28 Mairch 2019, at 09:29.